A former police officer engaged in a "continuously abusive course of action towards women", a disciplinary panel has found. Clarke Joslyn served with the Gwent force for 26 years, but was found to have breached professional standards while off-duty. The hearing found he had "deep seated attitudinal issues". The panel ruled he would have been dismissed for gross misconduct had he not resigned in November. The hearing was told he subjected one woman to controlling or coercive behaviour, threatened to "do her legs" and implied "something bad would happen" if she ever "humiliated" him. The panel concluded that he monitored the woman's Facebook profile, engaged in unwanted contact and behaved in an "obsessive manner". It also found Mr Joslyn pinned another woman against a wall whilst holding a knife and he used derogatory terms in messages to her. Chairwoman Susan Monaghan said: "The findings in this case were so serious that members of the public would have been appalled. If Mr Jocelyn was a police officer he would have been dismissed." 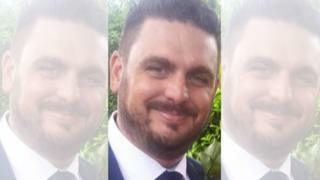 In written evidence, Mr Joslyn told the panel that the complaints against him were "fabricated, misrepresented and exaggerated". The panel considered the allegations against Mr Joslyn on the "balance of probabilities" rather than the higher, criminal standard of proof of "beyond reasonable doubt". Chris Daw QC, representing Gwent Police, told the panel Mr Joslyn's behaviour "typifies that of a bully". He described Mr Joslyn's resignation - after the facts of the case were heard - as "just another tactical manoeuvre to avoid the consequences of his behaviour" towards "two, courageous young women". After the hearing, Deputy Chief Constable Pam Kelly said: "We expect all our officers and staff to act with integrity and conduct themselves professionally at all times. "I would especially like to thank those who came forward with their concerns."